Bright New Way to get around safely! The patented Pathlighter® cane provides a circle of light at your feet so you can walk with greater assurance and safety. Now adjustable from 34"-39"
The revolutionary Pathlighter® cane not only provides the exceptional support of traditional orthopedic offset style canes, it offers the added safety of a light built right into the shaft to help see what surrounds you. 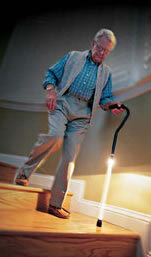 It provides additional safety in the dark for the vision impaired as well as peace of mind for their loved ones. Whether going up or down stairs, getting into the car, or finding your way in dimly lit areas, the Pathlighter® lighted walking cane provides an extra degree of mobility, security and comfort. And because the light switch is on the end of the handle, it's easy to turn on with a simple push of a button. The powerful Xenon lamp provides exceptional brightness which allows you to walk better, see better, and feel better. The Pathlighter® lighted walking cane is the perfect gift for anyone with impaired vision that could benefit from a lighted mobility aid. They'll have extra support and feel secure while walking in the dark. until the end of the 2018. If you would like to order by mail, please click here. Walk better. See better. Feel better. US Patents 6463947, 5351704 and DES408126.© Copyright 2002-2018 Pathlighter, Inc. All rights reserved.